Pie for breakfast??? Count me in! A delicious and healthy breakfast the whole family will love! Prepare oatmeal according to package directions for 2-4 servings. Meanwhile, in a small saucepan over medium-high heat, combine the blueberries, water, lemon juice, brown sugar and cornstarch. Bring to a boil, stirring occasionally. Reduce heat, simmer for 3-5 minutes or until thickened. 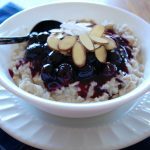 Serve oatmeal topped with blueberries, whipped cream and slice almonds.